Maybe I should buy one too so that I can be pair with these two. the shoes in Las Vegas that made the writer say 3 years relationship by using Shippers Collage. I wish my boyfriend have the same fashion taste as me like these two. At least we can decide rightaway where and what should we buy. Won't it help lessen the shopping time? All legit skydiving companies provide the proper overalls. Only in the movies and commercials do people skydive in everyday clothing. People don't skydive in training plants and t- shirt without a skydiving suit (the overalls) over them. Since my father and all my uncle were/are paratroopers, skydiving is kind of a family "thing." Lol. But since, as you say, you don't have experience in it, just watch any real skydiving video. There's more than one reason for wearing the overalls. If he truly went skydiving and just wore his street clothes, then the company PSJ went with didn't follow the proper procedures. The last pair - his in gray, hers in dark red are quite a stretch, I think. Do you guys really think that they'd on purpose wear matching sneakers if they were trying so hard to hide their relationship? To me it seems to make sense that they'd be very careful not to. It's not like they don't know fans are looking with magnifying glasses at everything they wear and do. Unless they don't care what people think. But if they don't care about what people think, then why the mystery and not attending awards shows together? It all just seems contradictory. I still can't get over buying $3,500 for what is basically a pair of sneakers. I know they can afford to buy them, but, Why? Even if he did, that's a sign of friendship, not of dating. Recommending a place of work to a friend is done all the time, and doesn't mean dating. You're absolutely correct. Jumpsuit and eye protectors/ goggles are essential for skydiving. it looks like the Skydiving and the fan sighting wearing white shirt was yesterday and today he wore colored shirt and shorts. I wonder if it was indeed photoshoot anyway because Ziozia collection is formal attire right? @parkparkloveu, they may have been blocking shots for lighting, etc., before he changed into the more formal attire. it looks﻿﻿﻿﻿ like the Skydiving and the fan sighting wearing white shirt was yesterday and today he wore colored shirt and ﻿shorts. What do you the white t-shirt that he is wearing because there are two fan sighting that he is wearing a white shirt? It's not about the t-shirt, but rather about using the right term. You're assuming the fans knew the right terminology. The picture from the air looks like hangliding, not skydiving. Unless the skydiving company is unlicensed and breaks laws, there's no way they'd have clients skydiving in just t-shirts. It's not dangerous just in the air, but also in the landing. A parachute cords and harness are very tough and can do significant damage to bare skin. The air at skydiving altitude is cold even in the summer. Landing can often leads to a roll or two on the ground, and a t- shirt offers zero protection. No experience skydiving instructor or guide would allow a client, let alone a celebrity one, skydive in just a t-shirt or anything other than a full jumpsuit and goggles. Now UNDERNEATH the jumpsuit, yes, t-shirt and loose pants or shorts. The exceptions are if he went tandem skydiving, which means he was attached to the instructor, and the instructor did all the work. In that case, while it's less safe, he could just be in sports clothes and, sometimes, a helmet and goggles. In those cases, they keep to a regular civilian parachuting altitude, which is lower than skydiving altitude. The jump is shorter and the tourist is basically like a baby in a harness attached to Mom or Dad. Professionals or advanced people who jump out of airplanes actually differentiate between parachuting and skydiving, although the general public often doesn't know the difference and uses them as synonyms, but they're not. 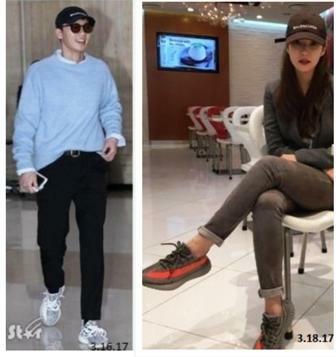 We cannot conclude they are 100% a couple based only on same clothes or shoes. 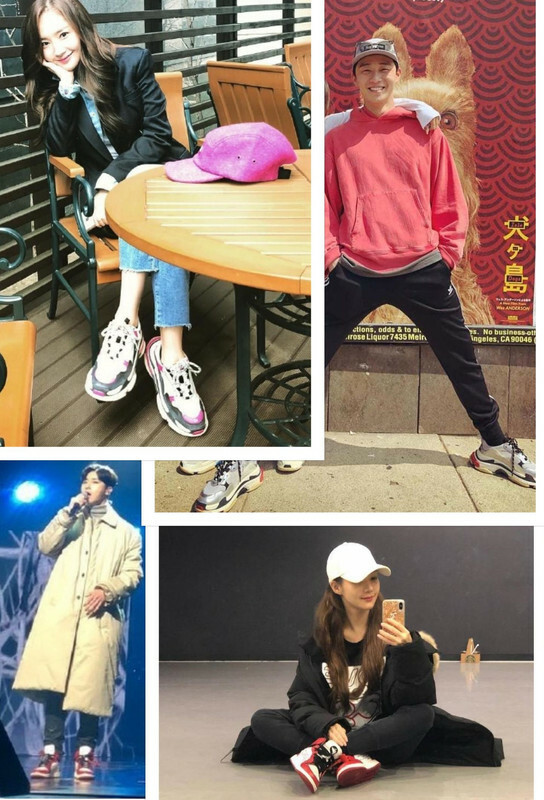 Korean couples are fond of couple wears but Korean celebrities also wear same brands from time to time because they are given those things by Sponsors. LMH has many pairs of Balenciaga hats and some are the same as PMY. JCW also has clothes similar brands with PMY. CM shippers even have this collage of JCW, PMY and Leon wearing the same shirts. I agree with @tali58 about if they are hiding something why wear similar shoes but then if they are not hiding, why did they avoid each other in award shows and when they finally attended one in China, they acted like strangers while on stage to the point of becoming very awkward. i don't think ppc bought those things as couple items. they just have the same fasion taste. Yes I saw it before but then there are 2 tarot readers in weibo who posted about them after Cosmo Awards. The other one said they are in relationship while the other one said big chance they will be together but not yet together as of now. I see psj in Australia wearing bracelets look like pmy wear in Phuket to..I am share in my insta,,a lot people coment is same,,now I am deleted,,because ppc korea say don't update, fto or video make ppc uncomfortable,for me I will waiting, maybe is need long time,is okay.